Parental Tech: Help for the Helper in Getting Writing Help! Help for the Helper in Getting Writing Help! Okay, so my niece needs help with her writing but I can't seem to find the one size fits all online writing course. Now if I were rich and famous I would just hire a tutor or send her to a Kumon center and just like my car they could diagnose her and fix the writing problems. But I'm a person of humble means and those aren't financially accessible to me right now. So I had checked out Time4Writing writing courses before and was very impressed by their selection of writing courses for kids of all ages. And at less than $13 per week of instruction, this is a steal of a deal. But to be honest, I was always overwhelmed at the choices and had no idea which one made sense to fix her problems. So today when I visited the site, I found this nifty writing problem diagnostic chart with the solution or best class paired up with typical writing problems. What a releif for me. I easily found her problem - she can't seem to stay on topic when given a writing assignment. I found her problem on the chart and finally I can move forward and enroll her into the Welcome to the Essay class with confidence. And even after 2 weeks of the 8 week class, if we need to change, we still can without penalty. 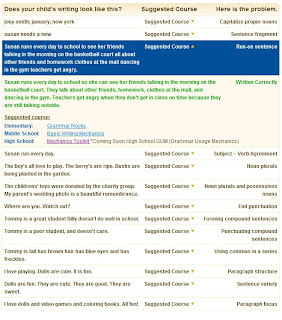 Check out writing class selection chart and select the perfect class for your writer with confidence!